We are one of 106 Family Resource Centres around the country funded through the Family Support Agency. The ethos of the Family Resource Centre Programme is to empower individuals, build family strengths and support all families facing the day-to-day challenges of everyday life. 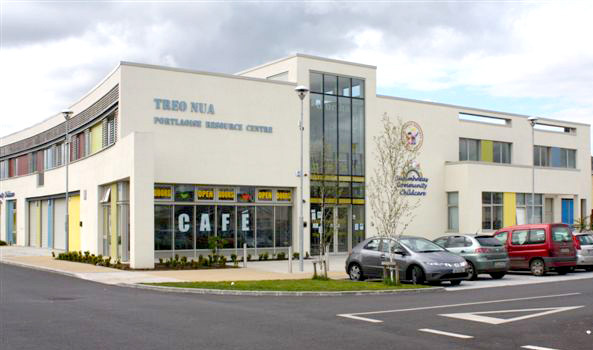 Portlaoise Family Resource Centre is located in the new Treo Nua Resource Centre building on Harpurs Lane close to the centre of Portlaoise. This is a new state of the art community facility equipped with excellent training rooms, meeting rooms, community hall, IT Room and access to the new HSE Primary Health Care clinic. The centre also houses the Open Doors Café where you can have tea, coffee, snacks & lunches while you browse the web at your leisure. The Portlaoise Family Resource Centre is open from 9am-5pm Monday to Friday, however activities take place at evenings and weekends also so if you’d like to know more about a particular service please feel free to pop in. You can also call us on 057 86 86151, email us at info@portlaoisefrc.ie, or use the contact form. Through Suaimhneas Community Crèche we provide a range of services to suit parents & children. We provide a low-cost Counselling service for individuals, couples, children & families. We operate a sliding scale fees policy to enable people to avail of the service at a price they can afford to pay. We host several groups including Women’s Group, Men’s Group, Parent and Toddler Group and Meditation Group. We provide a range of activities, projects & programmes for young people of all ages including Forόige Club, M&M Youth Group, After Club and Youth IT Projects and Activities. Portlaoise Family Resource Centre is committed to providing a range of supports and services to families to make the day-to-day challenges of family life a little easier to manage.